Matter of Trust is the fifth novel to feature Boston-based lawyer David Cavanagh though in this outing he’s travelled home to Newark, New Jersey. In his youth David had two best friends, Chris Kincaid and Mike Murphy, though he hasn’t kept in close contact with either. However there is a shared history that binds the three together and when Chris is arrested for the murder of a woman they all knew, David can’t help but get involved. Deeply buried family secrets need to be investigated before there’s even a glimmer of hope that Kincaid can be successfully defended. This is a standard legal thriller of the sort I’ll admit I’m not that interested in (I chose to read this one as it’s eligible for this year’s Davitt Awards). I’m afraid they all merge into one shortly after I’ve read them as I don’t find any of them that distinctive and this is another one that I suspect will fall into the same category. It’s not that it’s particularly bad, just not particularly unique. The theme of friendships that bind one to behaving heroically (or stupidly depending on your point of view) has been done before, as has the character of an overbearing mother who will go to ridiculous lengths to advance her child’s career and most of the rest of it had an equally vaguely familiar feel to to it (though I’ve only read one of the author’s earlier books). The book does move along at a decent pace (apart from the bits we spend learning about the distinctions between the Boston and New Jersey legal systems which I can’t believe would interest anyone outside lawyers in either location) and there is undoubtedly skill in putting the complex plot together but at the end of the day it reads more like a TV-show script to me with its easily telegraphed plot twists, soap opera-style ending and fairly stereotypical character types. I guess this is not surprising given Bauer’s background (she has been a programming executive) and her stated desire for the books to become the basis for a TV series. I’m afraid this just had a bit too much of an American TV sensibility for me to class it as top-notch crime fiction of the sort I can really get my teeth into. If you ask me about it in a month’s time I’ll be hard-pressed to remember a single detail. I suspect in print I’d have skipped large chunks of it but Bill Ten Eyck is a good narrator and I didn’t mind him accompanying my on my early morning commutes this week, even if the story he was telling didn’t fully engage me. Sydney Bauer is a former journalist and TV programming executive and is yet another writer who chose to use a pseudonym because she was told men would not read the kind of legal thrillers she was writing if her own recognisably female name was on the book covers. The name came from two television characters (Sydney Bristow in Alias and Jack Bauer in 24). 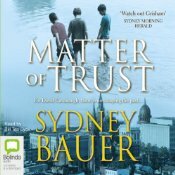 Check out this interview (available in audio or written transcript) with Sydney Bauer for more information about her writing and career.